For the Writing of the Thing. I’ve got the creative thoughts rumbling for adventure writing, but I don’t seem to have the energy or what I think I should have for the organization of these creative thoughts. I work on a Chromebook. I’ve looked into apps for writing and help with organization, but I’ve not found one that willing fits the flow of my thoughts. I tend to “write by the seat of my pants”, therefore the organization is on the same line. Index cards? Yep, shuffle them up and throw them on the desk. This should work, right? Ugh. I had so much fun writing “The Heist of the Royal Jewels” for the Gongfarmer’s Almanac 2018. Having some encouragement to come up with more like it, I’ve come up with another idea. But I think I have overwhelmed myself with information. I just need to settle on just one thought and create around that. I’ve always wanted to be a writer and author. Of what, I’m not sure. I’ve had lots of encouragement to write and get published. It’s the getting started and like what I’ve written in order to submit something. I find it fairly easy to blog, journal, and just discuss what I’d like to do. Finding ways to be coached in the process is the challenge. I had fun in 2011 writing during NaNoWriMo (Nationa Novel Writing Month) in November. I wrote over 50,000 words in 25 days. It was a good challenge. I had fun finding that I had a story within me to write. And as I look back over the story, it has a “dungeon crawl” within it. So, now that I have summoned these words…I hope it sparks some coaching from those of you who write and have written an adventure module or more. I also hope that these words can get me to write, at least, the first sentence to an adventure module or two. Author joanAnewbeginningblogPosted on July 16, 2018 Categories UncategorizedLeave a comment on For the Writing of the Thing. Yes, well… it was my first Free RPG Day to participate in. One FLGS decided not to have it and by the time I had asked them whether they were having it, I was told that they had missed the order date for getting the Free RPG Day swag. The other FLGS ordered their Free RPG Day swag, but owner and managers went to Origins and those that were left to run Free RPG Day… were like me… had not run the event before. So, what did I learn about running Free RPG Day? Communicate. Communicate. Communicate. And that last minute “emergencies” will always come into play. Yes, I think one can be ready for last-minute emergencies. Meaning, have a backup plan. I will not go into detail, as I do not have details, at this time, to share. With that said, I will try to give a report on what the experience was for me. As an “emergency” presented itself to me just days before Free RPG Day, I scrambled to make the time changes. Well, with the FLGS owner and managers heading out of town to Origins, this became an almost impossibility to connect with the organizer who was going out of town also. Granted, I think this was only the third year for the FLGS to host Free RPG Day. And it also happened that last year Origins was on the same weekend. I will also say that with it being my first Free RPG Day event, I was less than wise about how to even go about planning and preparing for the event. I followed Facebook and Google+ for information from “the tribe”. It is quite helpful pre- and post- event for learning what can be done to better and make the event better in the future. Even though I run weekly games and bi-weekly games, I am no expert on running featured events. Just like when I went to GenCon 50 last year, I looked to others to help guide me with where to go and how to begin events. I had never gone to a gaming convention before. I could not have told you what it was like as a player, let alone how it was going to be as a GM (game master). So, this past Saturday for Free RPG Day, I show up at the FLGS at the scheduled time. I was informed that I was two hours early. “??? ?” Ok, so I hang around listening in on some of the games. There are some GMs, I gathered, will give looks to those lurking around listening. I’m not sure what these looks are to mean, but they did not feel welcoming to me, the observer. So, I move on. Well, the time finally comes for my afternoon DCC RPG game to start …and… no players. Where were the DCC RPG players? Another judge had a game scheduled for the first time slot at noon… no one showed. For this FLGS, this is odd. Any other Saturday the DCC RPG tables are loaded. Feels to me like the Free RPG Day flopped. BUT… as I looked around, DnD 5E was going well. Pathfinder had their players. And a newer RPG, Kobolds Ate My Baby had a table loaded with players. I should know, as I was one who sat down to play it. Later that evening, our regular DCC RPG group … at least 3 players… came to finish “The Carnival of the Damned” by David Baity. Crawling through the “Fun House” and meeting with death. I have one player that receives chills at the sound of the “Dead” stamp. With this last game one of our 0 level halflings, Wee Biscuit with a Luck of 14 has earned his Level 1 “badge” to be the luckiest halfling in all of the Shudder Mountains. This coming Thursday evening, the Thursday Knights will get to close the carnival as they meet the Black Jester. With the carnival moving out of the Shudder Mountains, the players are asking me to stretch a bit from DCC to MCC (Mutant Crawl Classics). At this time, Goodman Games posted that they are out of the first printing and the second printing will come in July. I do have the Free RPG Day which had both the DCC Lankmar and MCC RPG introduction modules. I plan to run the MCC RPG “Museum at the End of Time” with both FLGS groups. Playing Solo AD&D adventures and stuff. I just love the old school adventures! When I was introduced to D&D, I began to research the beginnings of Dungeon and Dragons. I went looking for the first books and adventures. I came across solo adventures and was intrigued. I love the Internet and the ability to find almost anything related to Dungeon and Dragons. I find that now that I am in love with Dungeon Crawl Classics, the early 1974 and 1984 Dungeons and Dragons fuel my love for these older types of adventuring. I found “Blizzard’s Pass”, “Lathan’s Gold” and “Lion’s Castle”. I’m not in love with the modules that require invisible ink pens in order to use them. “Lathan’s Gold” and “Lion’s Castle” do not require the invisible ink and therefore I find them fun and they are very good. I say “very good” because I find them not only fun to learn the rules, but also they provide keys to learning how to DM adventures. As the player of a solo adventure, you also get to be the DM. In “Lion’s Castle” it wasn’t until my fourth character, a second level elf, that I made it past the first encounter. I imagine, had my dice rolled better, I would not have been killed immediately. The conversions from the AD&D Armor Class to the present d20 system is interesting. I’m still deciding if I want to memorize the conversion chart which really would not be all that difficult to do. Yet, as I think about this, why would E. Gary Gygax create a system with a mechanic like it? Why not just take the number right off the d20 and make it the AC? Too easy? And I am not going to go into the why. 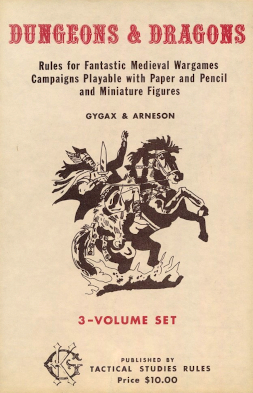 I am just going to thank E. Gary Gygax for his unique style and the desire to make math fun. I know some will not agree on this praise of math. I want to praise the modern d20 system as it does lend to more role-playing and fewer numbers crunching. What overwhelms me is all the d20 system games that have come with the open d20 gaming license. A year ago, I was just starting as a Dungeon Crawl Classics RPG judge. “Judge” is what DCC RPG calls the DM or GM in the game. I know other games call the GM a “referee”. In that year the amount of games I have judged has gone well off the charitable figure. Since last year’s GenCon 50, I have run a DCC RPG Road Crew game at a local FLGS every Thursday evening and a bi-weekly DCC RPG Road Crew game at another FLGS on Saturdays. Our recent games have been going through “The Carnival of the Damned” by David Baity. Initially written for a convention tournament, this module can be adapted as a funnel. I am not sold that it could be a one-shot. Each “attraction” in the carnival is a must to play. Be ready for PC deaths as there will be many! I have pre-gens off of Purple Sorcerer ready as the “attractions” come to an end. The PCs that survive are then able to meet up with more villagers in town also looking for their children. I am not a good records keeper and I think that someday I will do better. Well, someday hasn’t come. I need a record keeper. I have a player or two who do take notes on the games. I am appreciative of that. What is coming up next? Well, it is Thursday…so it is DCC RPG Road Crew night with the “Thursday Knights”. Saturday is Free RPG Day and our regular DCC RPG Road Crew game night with the “SeDoTu Crusaders”. You may see the schedule of all the northern Indiana games on Sanctum Secorum’s Event Calendar. August 2-5, 2018 is GenCon 51 in Indianapolis, IN. I will be there and have four events on the Goodman Games DCC RPG schedule. This year is the highest number of DCC RPG games ever. Make sure you pick up the Gongfarmer’s Almanac as I have a Level 1 adventure in it called “The Heist for the Royal Jewels”. Slapstick humor and death from falling pianos. The sewer monster is also terrifying. But you will need to decide for yourself what creatures lurk below and on top. Author joanAnewbeginningblogPosted on June 14, 2018 June 14, 2018 Categories dungeon crawl classics, role playing, RPG, Uncategorized2 Comments on Playing Solo AD&D adventures and stuff. Author joanAnewbeginningblogPosted on May 25, 2018 Categories UncategorizedLeave a comment on Writing for DCC RPG fanzine and Road Crew report – The Carnival is in town.